Hanoi (VNA) – Vice President Nguyen Thi Doan held talks with her Bulgarian counterpart Margarita Popova in Hanoi on November 27, during which she hailed the Bulgarian leader’s official visit as significant to promoting the traditional amity and multifaceted cooperation between the two countries. The State leader reiterated that Vietnam treasures its ties with Bulgaria as part of its foreign policy of independence, diversification and multilateralisation, and proactive international integration. She added Bulgaria’s impressive socio-economic attainments and increasing integration into the European Union institutions along with Vietnam’s dynamic economic growth and activeness in the regional and global arenas are prerequisites for them to enhance result-oriented partnership in various fields, both bilaterally and multilaterally. Vice President Doan also thanked Bulgarian leaders and all-level authorities for creating favourable conditions for the overseas Vietnamese community. 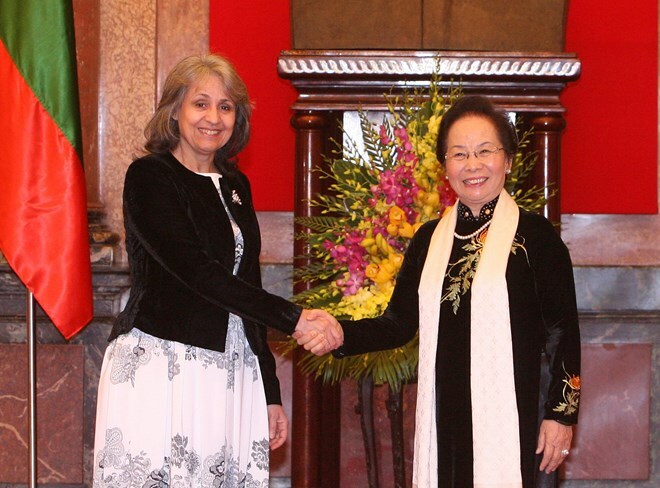 For her part, Margarita Popova spoke highly of Vietnam’s doi moi (renewal) achievements and voiced the belief that the Southeast Asian nation will continue to be a crucial factor for regional peace and stability and secure a worthy position in the world. She noted that her country wants to elevate its time-honoured friendship and multifaceted cooperation with Vietnam to a new level. Bulgaria supports the settlement of all disputes among countries by peaceful measures on the basis of international law, the Vice President stressed. The two sides took the occasion to inform each other about their respective nations’ situation, exchanged views on matters of shared concern and agreed on the direction and concrete measures to bolster bilateral relations in economics-trade, education-training, culture-tourism, and security-defence. They were also pleased with the countries’ close and effective coordination at international forums and agreed to strengthen affiliation in this regard. They concurred in promoting the effective implementation of the economic cooperation model approved by the countries’ leaders in 2013 with the aim to lift bilateral ties to a strategic partnership in the near future. At a joint press conference following the talks, Vice President Doan said both sides agreed on the need to set up a joint working group within the framework of the inter-governmental committee on economic, trade, scientific and technical cooperation so as to increase bilateral trade and improve the effectiveness of investment cooperation.